1. With the sheet inside out, place one hand in each of two adjacent corners. 2. Bring your right hand to your left, and fold the corner in your right hand over the one in your left, so the corner on top is right side out. Next, reach down and pick up the corner that is adjacent to the one that was in your right hand (it will be hanging in front), and fold it over the other two; this third corner will be inside out. 3. Bring the last corner up, and fold it over the others so it is right side out. 4. Lay the sheet flat, and straighten it into the shape shown above. 5. Fold the two edges in, folding the edge with elastic in first, so all elastic is hidden. 6. Fold the strip into a smaller rectangle. 7. Continue folding until rectangle is the size you want. 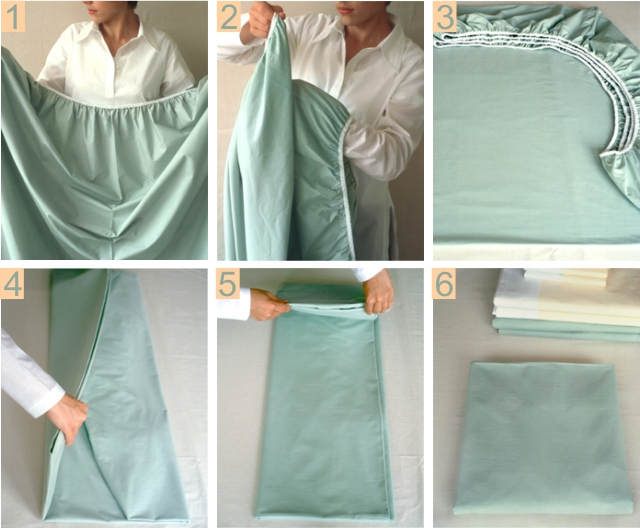 hahaha I could never fold a fitted sheet properly….It looks so simple!! Thanks for sharing! Haha I was actually JUST folding a couple fitted sheets like this, and thinking about how great a trick it is. Someone showed me last year and my sheets have never looked neater! That is flat !!! Not like mine.